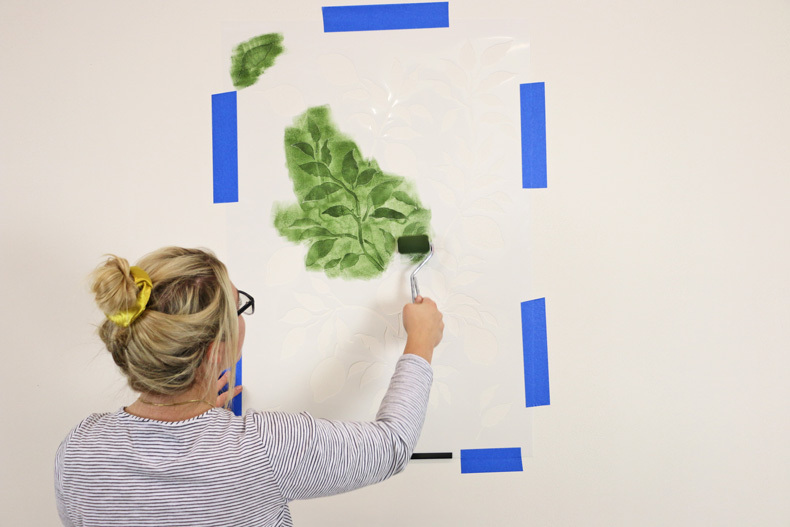 In this video Cutting Edge Stencils teaches you a SUPER EASY painting technique that will make your fruit and greenery look three dimensional! 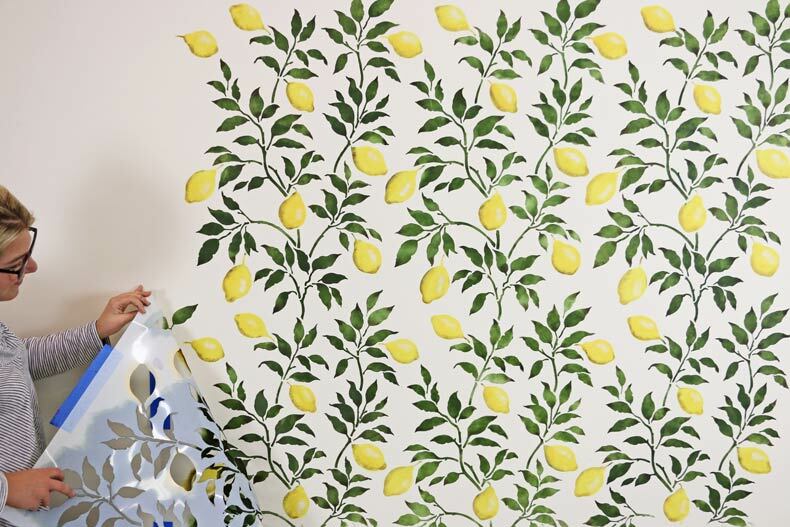 Our Lemons stencil is right on trend! 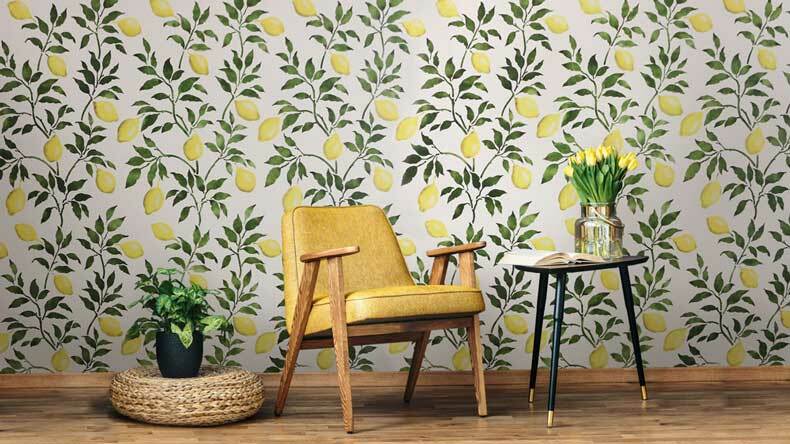 Florals, fruit stencils and botanicals are everywhere and we really liking the lemon craze! Finally, a great wall stencil design for kitchens! Of course, you can use this stencil in other rooms too, such as bath, bedroom and hallway. Perfect for nurseries, too! 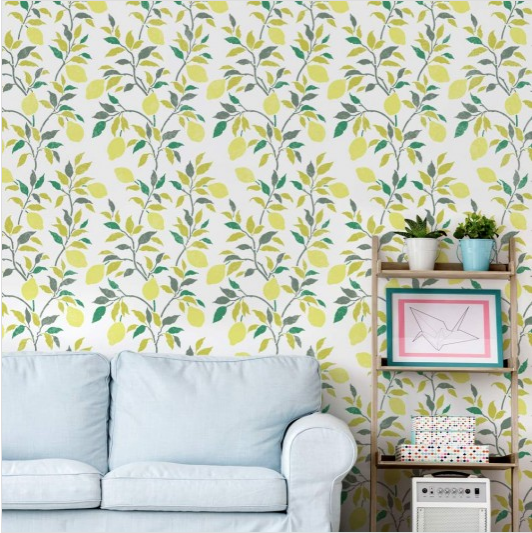 Now with the help of our lemon stencil and some acrylic or latex paint, your walls can be transformed into a serene lemon grove. 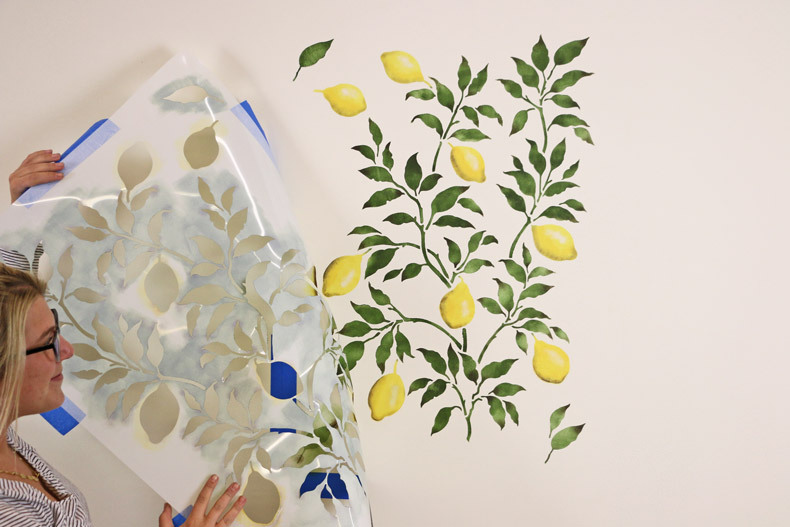 Unlike pricey lemons wallpaper, our reusable stencil offers you an opportunity to choose your own color combinations and to be creative. Let’s get started! First, we will use blue painters tape to hang your wall stencil. Make sure it is straight with a clip-on stencil level. Acrylic paint provides great overage so you don’t have to put a lot of paint on your roller. 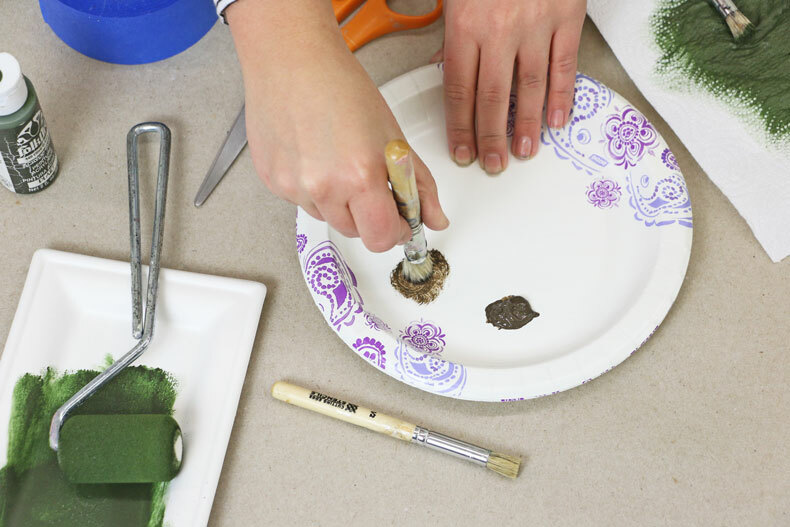 Pour a small amount of paint onto your plate and evenly load your two-inch dense foam roller. If there is any excess paint, off load it onto a paper towel. We are going to start with out leaf portion of the stencil. We will be stenciling them with Olive Green Acrylic Paint by Folkart. 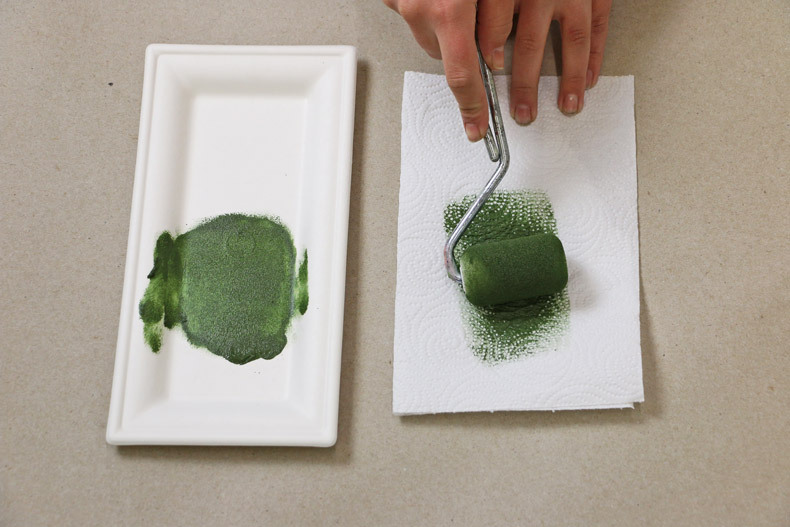 We choose Olive Green whenever we’re stenciling plants because it best represents a try leaf color. 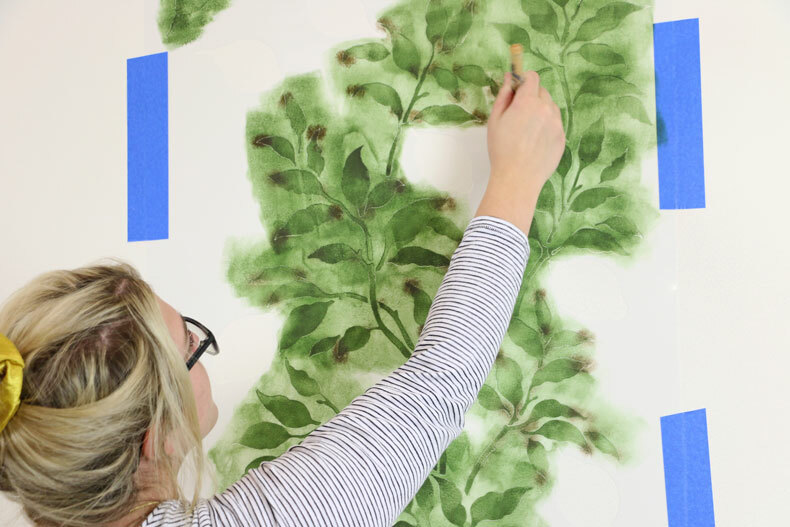 Lightly roll the paint over your leaves. Don’t press too hard or you will get bleed underneath your stencil. We want to give the leaves some dimension so we are going to shade them with raw umber acrylic paint by Folkart. 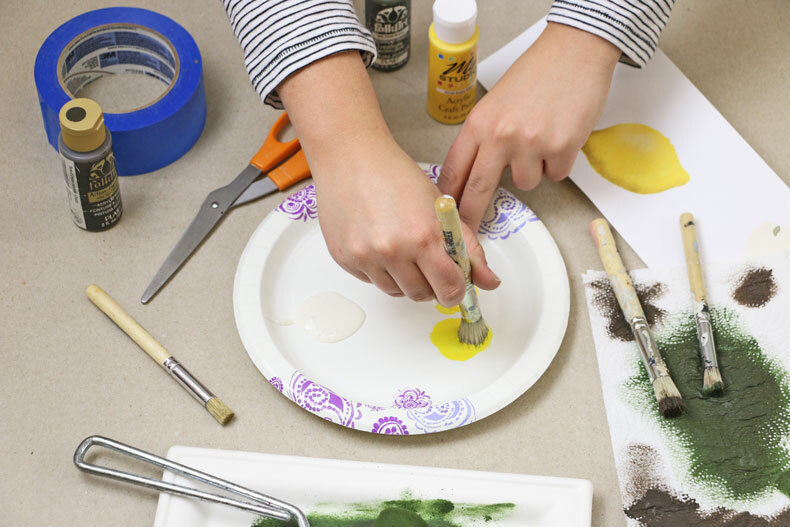 Take a 3/4 inch professional stencil brush and dip the tip into the paint. Now swirl it around on the plate, working the paint into the bristles. You only want a small amount of paint on your your brush. Now all you have to do is pounce the brush on the tips and bottoms of the leaves. It’s that easy! 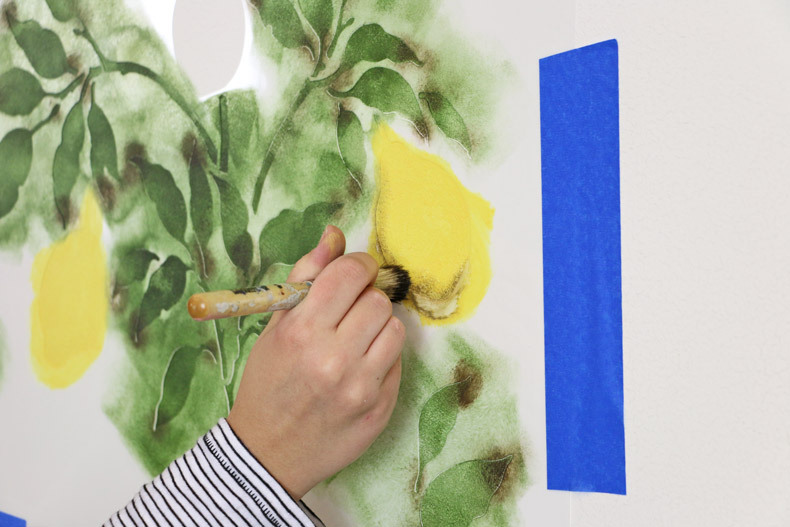 This simple and quick painting technique really enhances the appearance of your leaves. Time to move on to our three-dimensional lemons. 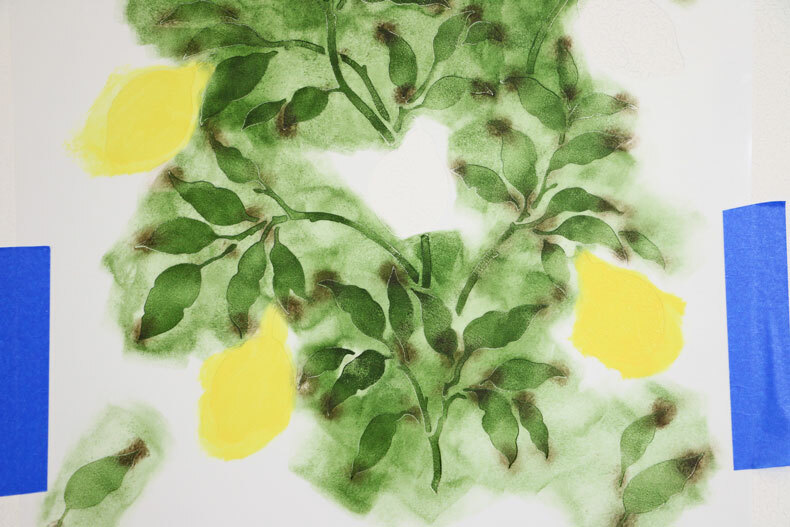 You are not going to believe how easy it is to stencil realistic looking lemons. 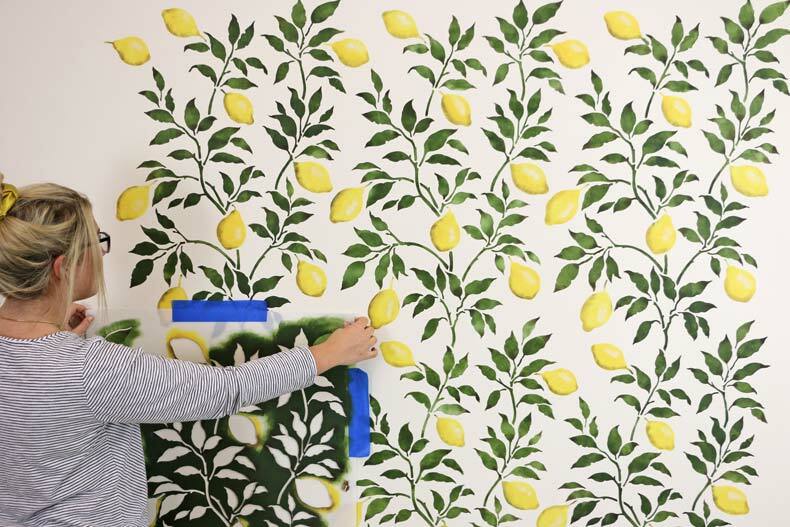 Take your dark yellow acrylic paint by My Studio and fill in your lemons. 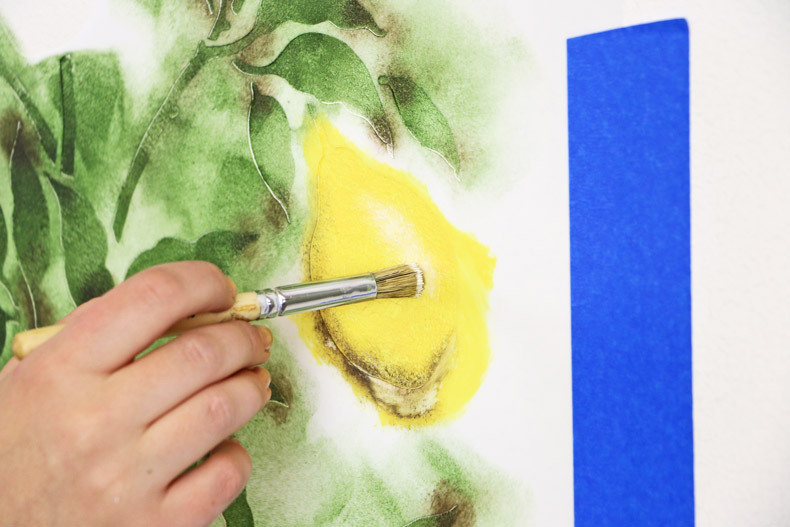 Take the stencil brush with Raw Umber and shade one side of your lemon to create a shadow. You can add a little extra shading towards the bottom as well. Make sure the side you choose to shade is consistent with every lemon. On to our final step – adding a tiny bit of white for some shine. Dry brush a bit of Navajo White by Benjamin Moore on the opposite side of the shadow. This should only be about an inch. Align your stencil with the registration marks and repeat! Complete this process until your entire wall is covered! 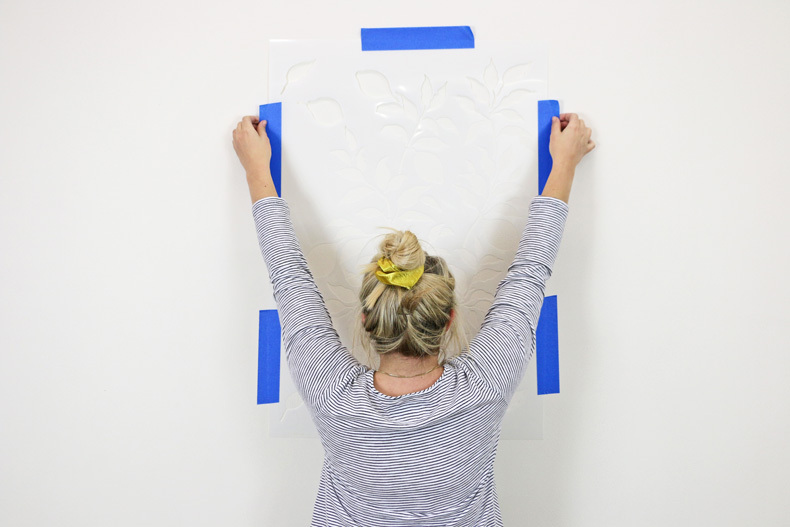 Stenciling is an easy and cost-effective alternative to wallpaper! 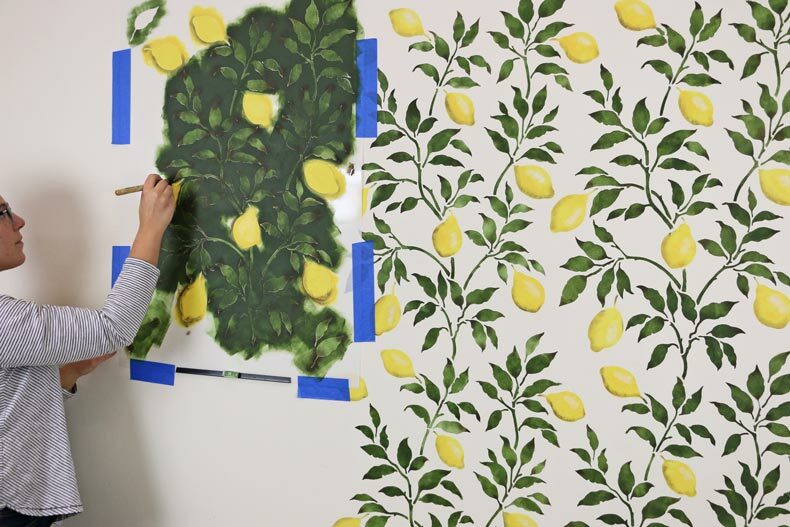 Avoid the hassle of applying and removing wallpaper and instead use the stenciling technique to get the same exact look for less! We love how this turned out. What do you think? Six Simple Stencil Ideas That Are Insta-Inspiring!